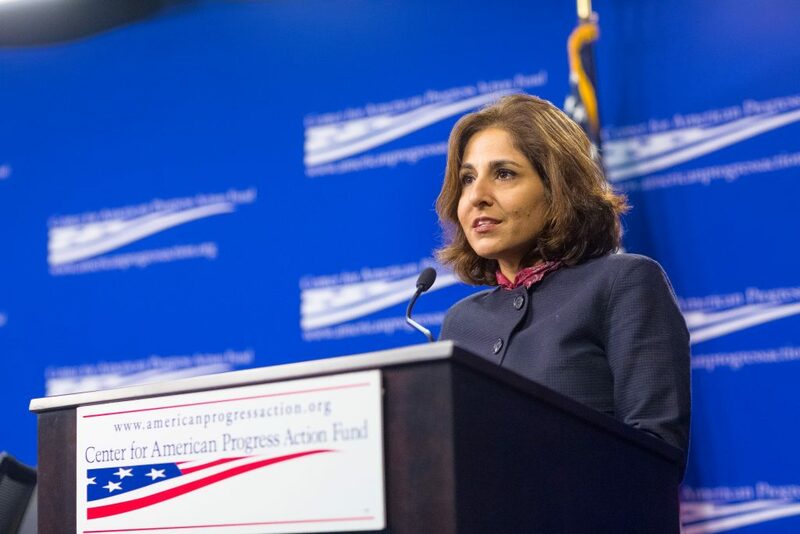 Neera Tanden is a long-time confidante of the Clinton political family and a former Obama administration aide who has served since 2011 as president and CEO of the Center for American Progress (CAP), a left-of-center think tank cofounded by Democratic Party fixer John Podesta. Neera Tanden was born in Bedford, Massachusetts to immigrant parents from India. At the age of 5, her parents divorced, leaving her mother to raise Tanden and her brother alone. She received her undergraduate degree at the University of California at Los Angeles (UCLA), followed by a law degree from Yale. While at UCLA, she met her now husband, an artist named Ben Edwards, while she was involved with the presidential campaign of Democratic candidate Michael Dukakis. She and her husband have two children. In November 2011, Tanden left the Obama administration and took over as President of the Center for American Progress, a left-wing think tank. Under Tanden, CAP has pushed a number of liberal prerogatives, including tax increases, legal status for large groups of illegal immigrants, controversial environmentalist policies. After Clinton was defeated by Republican candidate Donald Trump, Tanden committed the Center for American Progress’ resources to rapidly and forcefully “resisting” the new administration. Neera Tanden’s career has largely been defined by her relationship with the Clinton political family. Following Hillary’s 2008 Democratic primary defeat, Tanden joined the Obama-Biden campaign as its director of domestic policy. Tanden claims that she was the highest-ranking person on the Hillary campaign to serve in the Obama administration. In November 2011, Tanden left the Barack Obama administration and replaced John Podesta, formerly White House Chief of Staff under Bill Clinton and later Counselor to the President in the Obama White House and chair of Hillary Clinton’s Presidential campaign, as president and CEO of the liberal think tank Center for American Progress. In 2015, Tanden also took over control of the Center’s lobbying arm, the Center for American Progress Action Fund. Under Tanden, the CAP and its action fund have supported a number of left-wing policies. In 2012, the Center proposed a $1.8 trillion tax increase plan that included a tax rate hike, called for government-funded preschool months before President Obama included the same demand in his 2013 State of the Union address, and has fought for legalization of the roughly 11 million illegal immigrants in the United States. Tanden was an informal adviser to Hillary Clinton’s 2016 presidential campaign, providing political advice in a private capacity while her think tank provided intellectual backing and advocacy support to the Clinton campaign’s policy efforts. Similarly, after Tanden was named one of one of four co-chairs for the Clinton transition team Politico wrote the Center For American Progress was “Hillary Clinton’s government-in-waiting.” The article noted that through this organization Tanden would be able to serve Clinton’s interests once again as a powerful outside adviser who would play a central role in a Presidential transition. Additionally, the language that Tanden used in the emails against people she disagreed with became a point of controversy. The New York Times described Tanden’s emails as “profanity-laced” and fiercely protective of Hillary Clinton. After the 2016 election, Tanden announced that she was committing CAP and CAP Action resources to rapidly and forcefully “resisting” the newly elected president Donald Trump. Tanden has a long history of making profane and controversial comments. In a piece for the Huffington Post in 2016 entitled, “Donald Trump Doesn’t Deserve the Support of American Hindus” she questioned an Indian-American businessman’s support for Republican candidate Donald Trump and suggested because of his race, he should not support the candidate of his choosing.